t*rexes and tiaras: lonely as i am, together we cry.. I have to admit that until quite recently, where Sarah has been posting about them, I'd not really heard of Emily and Fin. Now that I have, I think I can feel a new obsession starting to grow. 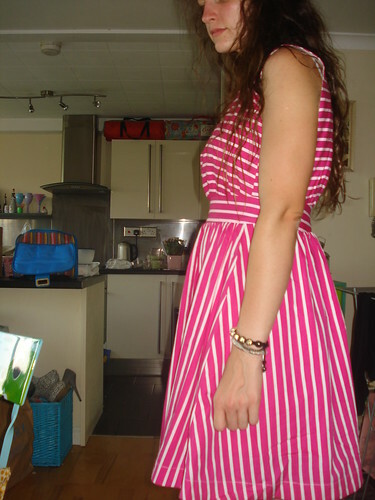 I was very lucky at the weekend to come home with a huge bagful of dresses, from both Sarah and Roisin, and this Emily and Fin stripey one is going to be a firm favourite - thank you, Roisin! 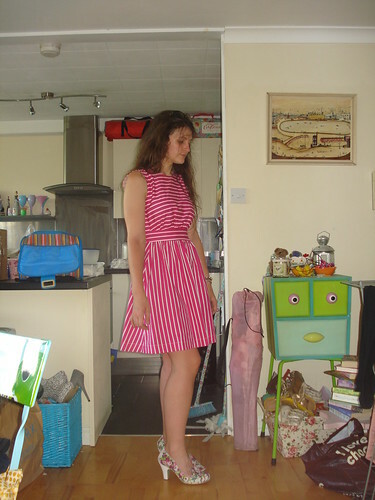 I decided the dress needed some pink and white shoes to go with it. And what better pair than these Summer Freckles heels, which are quite a short, chunky heel. The benefit to that being that I can wear them sans tights on one of the hottest days of the year. My office gets so hot during the day that my legs would be close to melting if I had to wear tights - this is the first week I can remember where I haven't. Sometimes the heat gets too much; sorry to all and sundry for baring my pasty legs! The busy week continues, and I think I had quite a lucky escape last night. I went to pick up my theatre tickets (I'm quite excited, two things to go to this week alone!) and saw someone I've been trying to avoid. I've been thinking long and hard about this particular friendship over the past few months and came to the conclusion that sometimes, when a friendship isn't working, it's best to cut your ties to that person. Especially when it's a one-sided situation which seems to do nothing but drain my emotions. So I was quite glad that I managed to avoid their gaze, but a bit sad about the whole thing, in a sort of reminiscent way. Not that I have any time for unscheduled sadness this week. Tonight is the district BBQ and sports day evening, tomorrow is allotment meeting, then the theatre and my weekend is already pretty full. Argh. Oh it's just so pretty! Yay for free frocks. It really is sad when you have to let friends go but sometimes it is for the best. Looking gorgeous char! 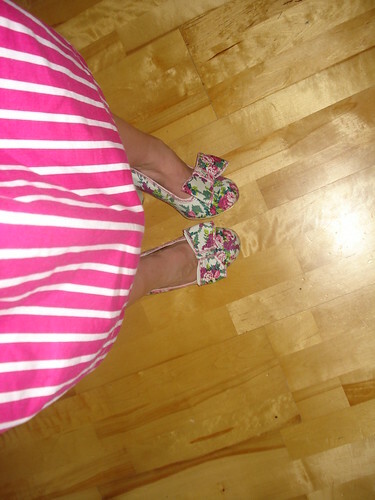 Great dress and shoe combination, you can't beat florals and stripes (or free dresses!). It is sad when a friendship comes to an end but if it was nothing but a drain then it's for the best - friends should be uplifting and a joy to be with! That dress wins at life. LOVE it. Stripes are the best. Ooh it's so cute! Perfect for summer. Aw I am so happy that the dress has found a good home - it suits you so well! And I know what you mean about the friendship situation, and part of you will probably feel sad for some time about the way things went, but it's best to cut any such unnecessary drama and stress out of your life. It doesn't add anything, it only takes away. That dress is super gorgeous, got a really lovely shape to it.